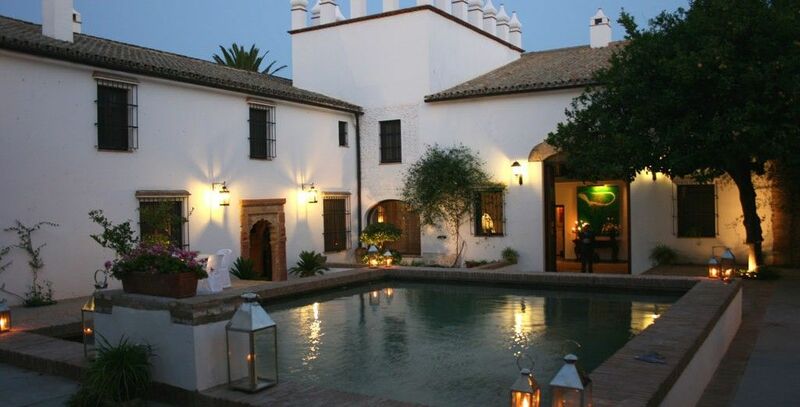 Fain Viejo has been an Arab fortress, a monastery, an olive mill, and is now a splendid country residence. It is an impeccable setting for weddings, anniversary celebrations, corporate retreats or any special event. An architecturally distinctive, pristine white building sits on five hectares amid lush gardens. Walk amongst almond, olive, orange, lemon, pomegranate and palm trees. The property is home to a 500 year old Ombu tree that has been the inspiration for a wealth of local lore. But the real legend of Fain is the gold treasure said to be buried here, which has never been found. Fain Viejo has ten bedrooms, each with a unique layout and configuration. Some have cozy sitting areas, fireplaces, others have a loft with chaise lounge or a charming writing desk. Some overlook one of the two reflecting pools, equally beautiful in sunshine or candle light. The property has sixteen bathrooms, some with marble fittings and gorgeously tiled walls. Reception rooms and great halls with vaulted ceilings provide a variety of spaces, making Fain Viejo perfect for a corporate retreat. The professional kitchen can serve and seat up to 500 guests in either of two dining rooms, a banquet room or outdoors among the trees and under the stars. The swimming pool is large and inviting, flanked by a lawn, a variety of trees and a shady gazebo. The property also has a library and a museum that houses artifacts from its days as an olive mill. Walk down the road to the Arcos Gardens golf course, go horseback riding, or take a cooking class from one of Spain’s most celebrated young chefs. Explore the charming white villages that are carved into the Andalusian hillsides.